Selection posts are a series of vintage blogposts from Artexte (2008-2015). The development of a collection like Artexte’s occurs on a regular basis: the arrival of new periodical issues, catalogues and monographs from all regions of Canada, daily additions to our numerous files and the discovery of previously uncatalogued materials in existing files. On occasion, the collection experiences sudden growth with the arrival of significant bodies (in number or quality) of coherent (or heterogeneous) documents that we do not yet possess. Surprises can happen on a daily basis. The development of a collection has progressed, by and large, due to the combined donations of thousands of individuals, organizations and institutions over the past 33 years. Last April 19, artist Clément de Gaulejac came to Artexte and his visit corresponds to these two “ways” of adding to the collection. Institutions rarely recognize these kinds of visits, but we should do so in this case. Clément de Gaulejac brought along a number of documents from his artistic practice to be added to his artist’s file at Artexte. His presence on that day was also very special (for all of us) as he also came with a large and recent set of posters of his own creation. Between April 12 and November 2, 2012 Clément de Gaulejac published a series of drawings on his blog L’eau tiède in support of, in reaction to, in dialogue with, and in response to the student and social movement of the spring and summer of 2012. The digital drawings were disseminated through his website and circulated via numerous social networks. A number of these drawings were reproduced as silkscreens during open and collective workshops (Diffuse et resiste), and made available, brandished, worn and posted in marches and manifestations. 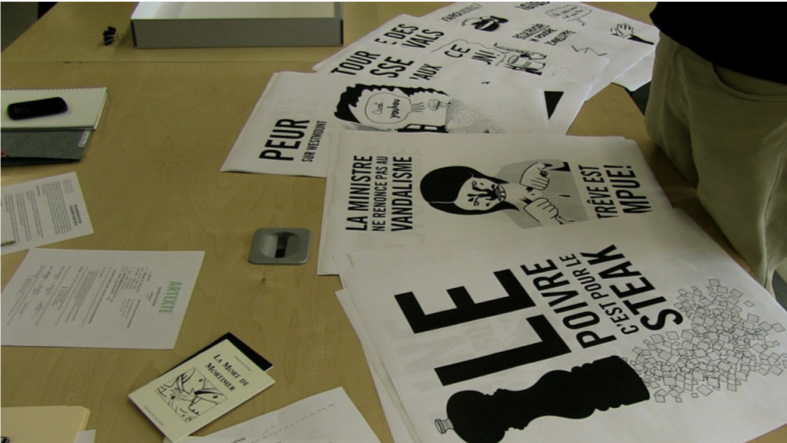 In the spring of 2013, the Centre des arts actuels Skol (Montreal) gave the artist the opportunity to exhibit the entire body of work from March 2 to April 6, 2013 – one year after the beginning of the student strike. The exhibition “Clement de Gaulejac: Motifs raisonnables” is now over, and Artexte is proud to receive a special edition of this entire body of work in poster form. Consisting of 76 posters, this ensemble is situated between work of art, illustration, caricature, press drawing and poster… Artistic and social – even pedagogical – the process of the artist, approaching [post]conceptual art, document[ary], journalism and comics, these works (like others from his multidisciplinary art practice and writings) “install a back-and-forth between the careful observation of everyday and formal research on language”.1de Gaulejac, C., Uhl, M (2009). Entretien avec Clément de Gaulejac. Spirale, 49-51. The “hybrid” status of the work (for lack of a better term) led us to contact him to see what future he envisioned for this body of work. Artexte, which does not acquire works of art, recognized an opportunity to add it to its Special Collections. “This is to pose the question of the body of work’s destiny and resonance—both political and aesthetic—after the events. How can the drawings be displayed in respect of this simultaneously collective and singular authorship? (…) To sidestep potential art market recuperation: donate the complete series to a Montréal archive to be safeguarded as a document belonging to the common good…”2Schütze, B. (2013). Drawn by an Involuntary Engagement. Other documentary institutions in Montreal will add screen prints to their collections that were produced during the workshops. Artexte, however, is the sole repository of a complete set of the 76 posters. Another aspect (amongst others) of interest is that users will be able to read and to consult the posters as one would leaf through a publication. In this way, there is a renewed accessibility to this body of posters that is different from their online dissemination, from their appearance as posters in manifestations and finally, from the exhibition on the walls of a gallery.3 (). A digital slideshow was shown during the exhibition "Clement of Gaulejac: Motifs raisonnables" on the walls of the Centre des arts actuels Skol that showcased a series of photographs indicating the spread of the different posters in the city, during the marches and manifestations. The slide show is included with the posters and is available for consultation..
We would like to thank the artist for this unique set of 76 posters that – it goes without saying – is unparalleled in any other institution in the world. We already know that the artist is not finished with his political engagement. He plans to make other deposits to this body of work in the future. We would also like to thank him for the confidence he has shown in our ability to properly mediate and to contextualize this body of work which is social, political and historic within the Canadian visual arts since 1965. You can visit us at Artexte to see this set of posters, and to consult other documents by Clément de Gaulejac. Artexte thanks Éric Legendre for his contribution. A digital slideshow was shown during the exhibition "Clement of Gaulejac: Motifs raisonnables" on the walls of the Centre des arts actuels Skol that showcased a series of photographs indicating the spread of the different posters in the city, during the marches and manifestations. The slide show is included with the posters and is available for consultation.